1. You, the school director, contact me to discuss your needs. We’ll talk about how many students attend your school, the grounds upon which you’re located and work out a date to schedule your “Picture Day” as well as a back-up rain date. Any concerns and questions you have will be taken care of. 2. I, Jessica of Captured by Jess, will mail you a packet of flyers to send home to parents detailing their child’s date of pictures as well as what to expect that day. I may also hand deliver your packet to quickly meet with you and do a site walk-through to scout out possible locations to shoot student’s portraits and note where the sun is at that particular time. Natural light has it’s unique challenges! 3. Picture Day! Expect it to be fun yet professional. If possible, classes will be ushered out to the site in small groups. Each child should take no more than 3-4 minutes! Parents are under no obligation to order and everything will be offered a la carte. No packages, no fuss. Order exactly what you want and nothing more. A few novelties will also be available such as stickers, magnets and key rings. 5. 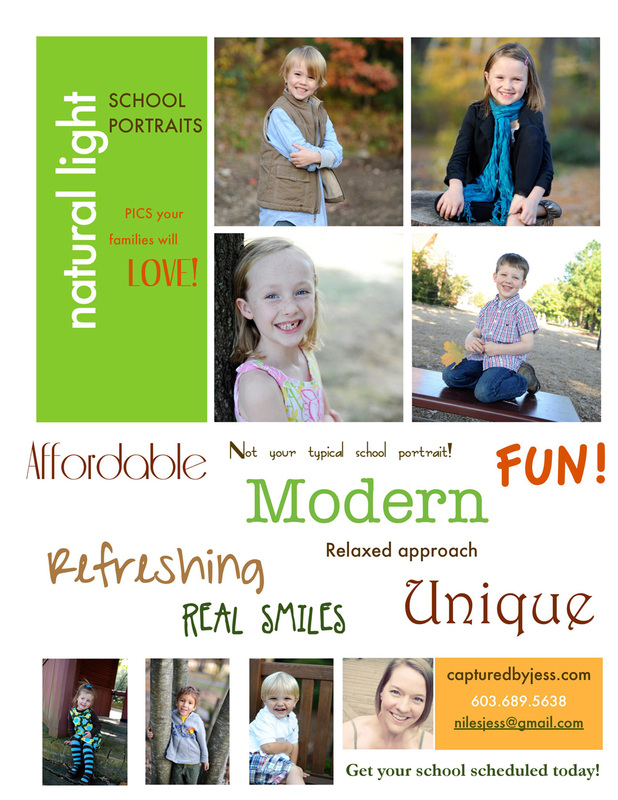 As a thank you, children of employees will receive a complimentary picture package. Also free of charge, directors and teachers will receive digital proofs of their headshots should they choose to be included in Picture Day. Perfect for personal and professional use!